PCN Flight West: DL Capt. John Thomas Lynch Jr.
DL Capt. John Thomas Lynch Jr.
News has been received with the passing of DL pilot Captain John Thomas Lynch Jr., age 75. 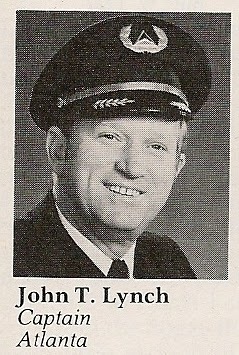 Born/raised in Mississippi, Captain Lynch joined Delta Air Lines 02-14-1966 and was based Atlanta. Winkenhofer Pine Ridge Funeral Home , 2950 North Cobb Pkwy, Kennesaw GA 30152 | 770-422-7299. ....from retired ATL Captain Don Collins. Lynch was born 9/10/1938, hired 2/14/1966. He was not on my NET, is not a member of DGW. Don't know about Pioneers. John T "Tommy" Lynch passed June 20th after a short illness. His former wife Sylvia (don't know if she's retired ) a Delta Flight Attendant called to inform me. She can be reached at 770 428 3823 and said there will be A Celebration of Life but as of now plans are uncertain. Would you contact whoever needs to know or give me the info as to who to contact. Tommy was in Class B-66 as was I. We started on Feb. 14, 1966 and he was from Raymond, MS.